Alicia: Finally onto the start of our Ecuadorian adventure. We arrived in Quito to possibly the best hostel we've stayed in so far - Jumbo Lodging hostal in the Old Town which was a nice start to the trip with freshly made coffee, fruit salads and NUTELLA! Enjoy the little things I say :) having missed the England game in Peru we went to La Mariscal (Gringolandia) to watch England-Sweden and fill up on Mexican food having been craving spicy food throughout Peru. The rest of our weekend we spent buying odds and ends for our trip to La Hesperia and ate at Cafe Mozaico - a lush Equatorian-Greek restaurant on the hill overlooking Quito. 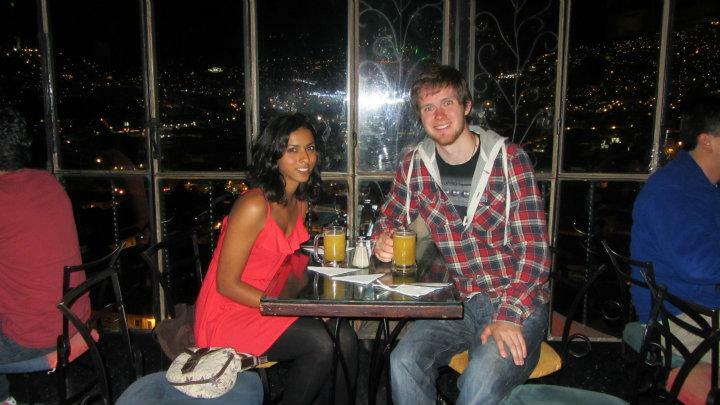 Was great and had awesome cocktails and easily the best views of Quito.